*Food distributions have been suspended in the north western towns of Bouar and Bozoum because of fighting. *10,000 people received food rations of cereals, pulses, vegetable oil and salt in Bouar. Since the start of the year. After a first convoy of desperately needed food supplies reached the capital of the Central African Republic (CAR), the UN World Food Programme (WFP) welcomed the cooperation that made the tense road journey possible but warned that securing the country’s roads is crucial to provide a food lifeline to growing numbers of displaced people. Ten trucks carrying WFP food – 250 metric tons of rice and maize meal – arrived in Bangui on Monday, after a 600-kilometre journey from the Cameroon border. The trucks were part of a 60-vehicle convoy escorted by troops from the African-led International Support Mission in CAR (MISCA). The convoy was slowed by frequent improvised checkpoints set up by armed groups. Another 41 commercial trucks carrying WFP cereals are still stranded at the Cameroonian border, along with hundreds of other vehicles. Drivers are reluctant to cross the border, despite the offer of military escorts along the road to Bangui. The impact on food supplies to the capital and the rest of the country has been disastrous. “We cannot afford interruptions to the flow of food that so many displaced people depend on after being uprooted by conflict. 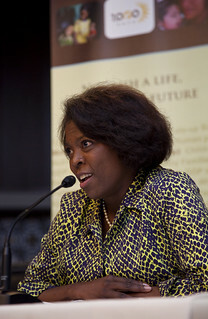 We are working with all parties to try to unblock the situation at the border so more supplies are on the move, while still looking at airlifting food from Cameroon as a last resort, though this would substantially increase costs,” said Brown. WFP is prioritizing distributions at the Bangui airport and has started further distributions to 40,000 people in and around the north western town of Bossangoa. Deliveries to other places cannot be carried out until trucks can drive safely along routes and their movement to Bangui is secured. WFP continues to urge all parties to the conflict to allow the safe and unhindered passage of humanitarian personnel and supplies to people in need. Food distributions have been suspended in the north western towns of Bouar and Bozoum because of fighting. Before the interruption, nearly 10,000 people received food rations of cereals, pulses, vegetable oil and salt in Bouar. Since the start of the year, WFP has assisted 193,000 people with food in Bangui, Bossangoa and Bouar, including close to 50,000 displaced in the makeshift camp at Bangui airport. 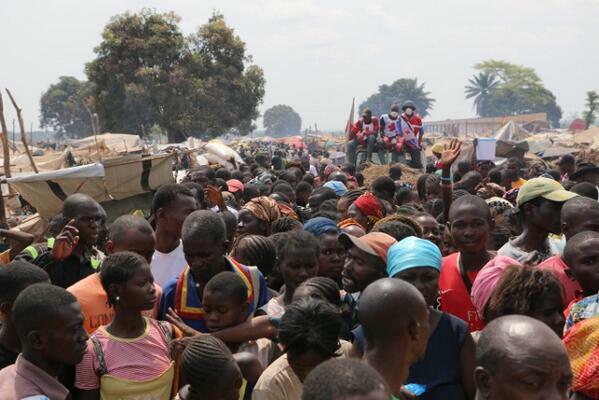 Some 25,000 people in smaller camps across the capital also received WFP food this month. WFP is appealing for nearly US$107 million to assist 1.25 million people in CAR over the next six months. In order for displaced people to receive food in the immediate future, new funding is required urgently to buy food that should be prepositioned across the country before the start of the rainy season in May. A rapid humanitarian assessment carried out 24-28 December in 86 communities including urban areas in Bangui and Bossangoa found that 2.6 million people currently require humanitarian assistance. Women’s priority needs are protection and food. Posted on 31st January 2014 by newsafrica. This entry was posted in Africa, African Security, Central African Republic, Democracy, Human Rights Violations, WFP and tagged Bangui, Bossangoa, Bouar, Bozoum, Cameroon, Central African Republic, Displaced person, World Food Programme. Bookmark the permalink.